Twelve firefighters are trapped atop a ridge off Santiago Canyon Road in Orange County after flames jumped the road. The blaze roared up the hillside and prompted the crew members to deploy their fire shelters. 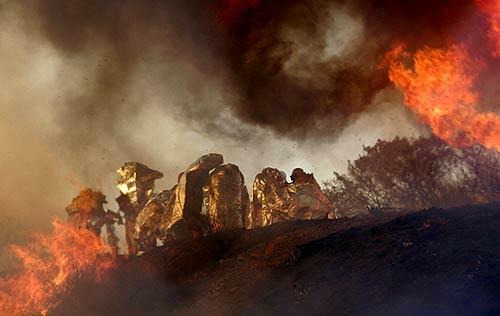 They were surrounded by burning brush, but they made it out alive. “We just remained calm, everyone did,” one firefighter said after he was checked out by paramedics. All of the firefighters were treated at the scene and did not want to go to the hospital. Can’t go anywhere and not be affected by these fires. I live in Riverside and work in Tustin, it’s miserable. What happened to the image? Very few pictures actually make me feel worried or scared, but this one does it. I was a wildland firefighter here in Oregon, and you do not use those fire shelters unless you absolutely have to. The protect against heat to a certain temperature, but direct flame will burn them. I’m glad they made it out alive. Not all of us are so lucky. Wait… who the fark took the photo?! !